Official Ankara has condemned China's treatment of its Muslim ethnic Uighur people as "a great cause of shame for humanity" and asked it to close the "concentration camps". In a statement on February 9, Turkish foreign ministry spokesman Hami Aksoy blamed China for arbitrarily detaining over a million Uighurs. Hami Aksoy said the Turkic Muslim population faced pressure and "systematic assimilation" in western China. "It is no longer a secret that more than one million Uighur Turks, who are exposed to arbitrary arrests, are subjected to torture and political brainwashing in concentration centers and prisons," Aksoy said. "We invite Chinese authorities to respect fundamental human rights of the Uighur Turks and shut down concentration camps," he said. Turkish President Recep Tayyip Erdogan had once accused China of "genocide" but has since established closer diplomatic and economic relations with Beijing. China's Xinjiang region is home to around 10 million Uighurs. The Turkic Muslim group, which makes up around 45 percent of Xinjiang's population, has long accused Chinese authorities of cultural, religious and economic discrimination. Practicing Islam is forbidden in some parts of China, with individuals caught praying, fasting, growing a beard or wearing a hijab, a headscarf worn by many Muslim women who feel it is part of their religion, facing the threat of arrest. China's embassy in Ankara posted a lengthy response to Aksoy's statements, saying that the accusations were false and urged the government to retract them. Kenneth Roth, the executive director of the US-based Human Rights Watch group, praised Turkey's move on Twitter. "This is a big deal: [Turkey is] The first Muslim-majority country to criticize China so directly for its horrendous treatment of Uighur Muslims, and one of the most powerful Muslim-majority countries at that," he tweeted on Sunday. "Now [is the] time for other governments to join Turkey," he added. China's crackdown on Uighur people has made headlines around the world. 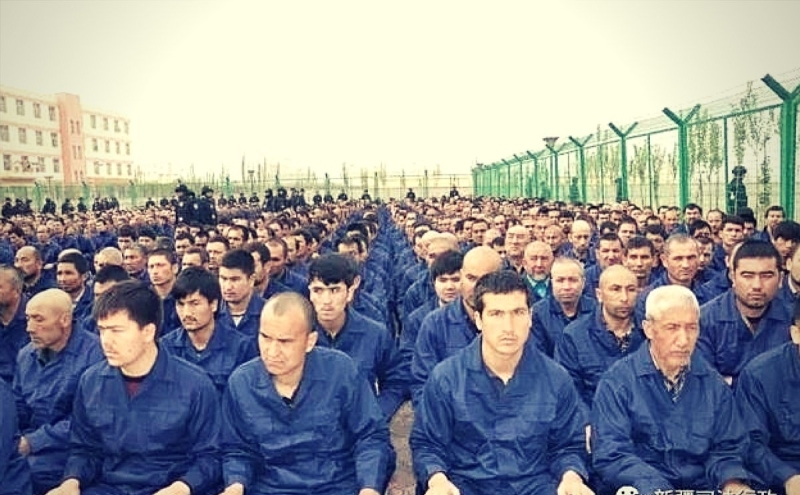 In August last year, a United Nations panel of experts said it had received credible reports that over a million Uighurs and other Turkic language-speaking minorities were being held in so-called "re-education camps" where they are made to renounce Islam. Beijing denies Uighurs are being held against their will and says these are "voluntary" vocational training facilities, designed to provide job training and to stamp out "extremist" tendencies. Last month, China passed a law to "Sinicize" Islam and make it "compatible with socialism" within the next five years. But most Muslim-majority countries have not been vocal on the issue, not criticizing the government in China which is an important trading partner. China passes law to make Islam 'compatible with socialism'. China has passed a new law that seeks to "Sinicize" Islam within the next five years, the latest move by Beijing to rewrite how the religion is practiced. Practicing Islam has been made forbidden in parts of China, with individuals caught praying, fasting, growing a beard or wearing a hijab, a headscarf worn by Muslim women, facing the threat of arrest. China has rejected the criticism, saying it protects the religion and culture of its minorities. However, in the past week alone, authorities in China's Yunnan province, which borders Myanmar, have closed three mosques established by the marginalised Hui Muslim ethnic minority, the South China Morning Post has reported.